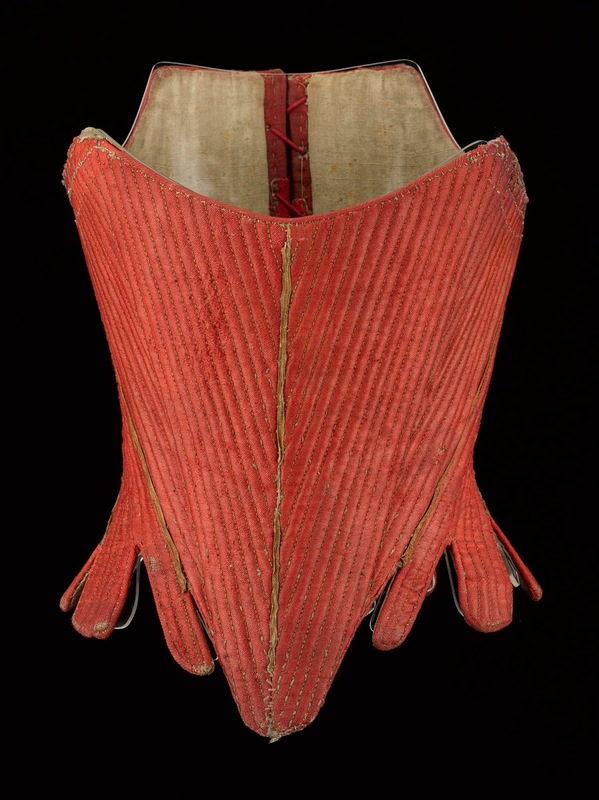 My latest project is a proposal for a book written specifically to help out costume designers and writers of historical fiction - a fashion history manual for 1700-1940 that focuses on visuals and on how the clothing works. The first chapter, on the early 18th century (1700-1739), is my sample, and it's making me realize how brushily we tend to deal with the period before the changes of the 1770s, and especially before the 1750s. I'm pinning down a lot of stylistic changes to at least halves of decades, but I'm finding stays surprisingly difficult. Like a lot of other aspects of fashion I've had to work out, the issue's complicated by museum dates that seem overly broad or just plain wrong. And for stays, there are considerably fewer artistic representations than there are for gowns, caps, etc.! I think I've been able to identify the differences between early-century and 1775-1795 stays - which was tricky, because a lot of earlier stays were dated later. Which is understandable, because they share some characteristics! - The point on the earlier stays stands out, with tabs placed on the sides, while the later stays have a plain, smooth point. - The later stays' decorative lacing is narrow and placed only on the upper half of the center front; the earlier stays are trimmed like a stomacher. - The earlier stays' boning is densely packed together, while the later stays make use of splayed boning channels in front. - The tabs of the earlier stays are essentially cut into the body and bound, where the later stays' tabs have more shaping. 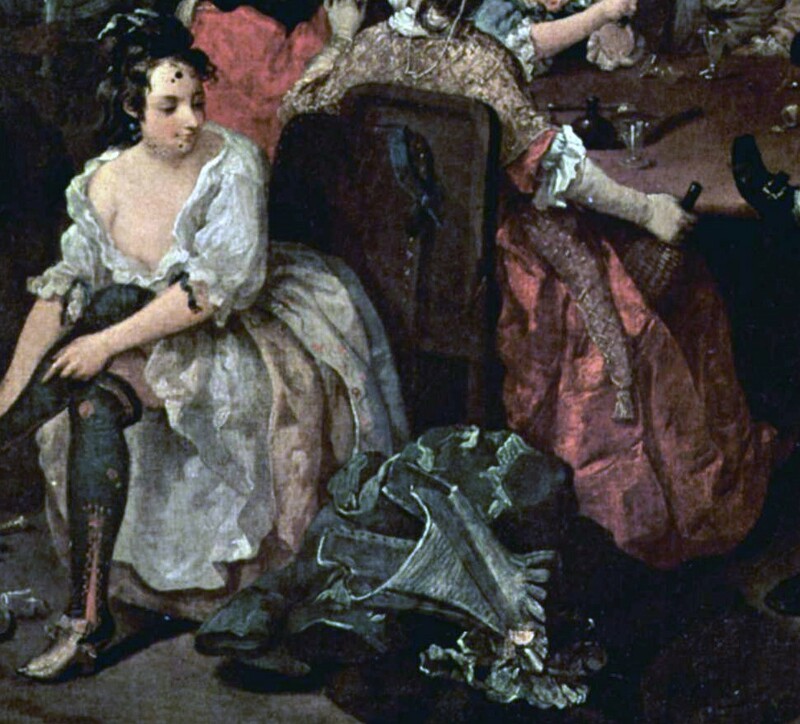 In very early cases, the neckline of the stays can be quite high and the straps angled out to the sides - in the 1680s-1700s, the neckline of the gown was wide and not very deep. 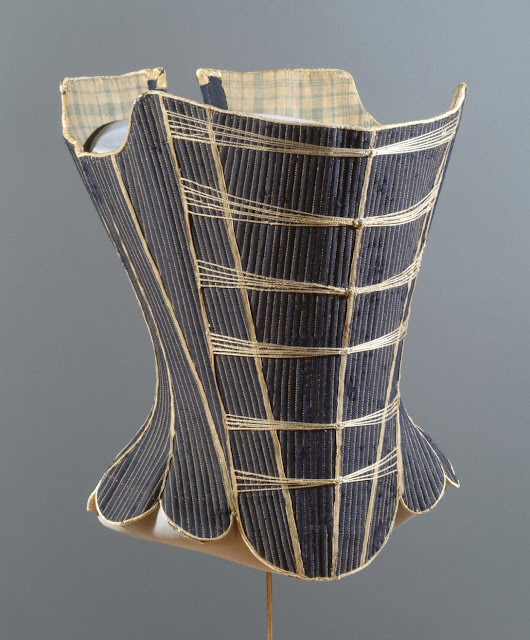 Of course, there are some stays that challenge categorization - for instance, these stays in the Boston MFA have the very long and narrow profile, parallel bones, and point-tabs of the earlier period, but the upper-center-front lacing of the 1780s. And what's happening with the thread eyes and eyelets near the bottom of the front? Mysterious. One type of stays has the front pieces boned at an angle, running down to a point at the bottom. I suppose it's not too loosey-goosey to date both types to 1740-1770, considering how broadly the early and late ones are dated, but it feels wrong. There are enough that conform to one type or the other that sequencing makes more sense to me than simply the wearer's/maker's preference. Does anyone else have more information on the subject? 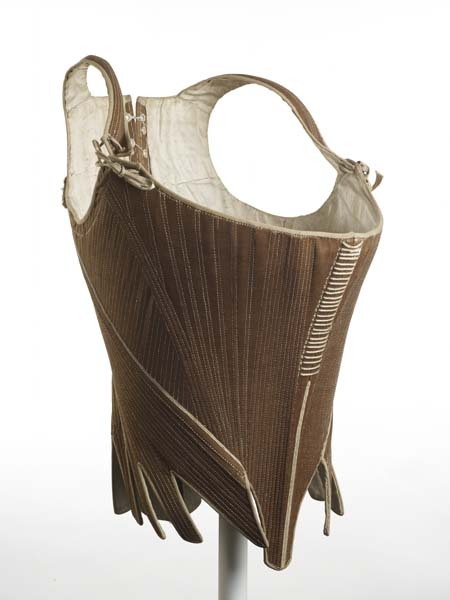 Or on interpreting the high number of "working" strapless stays vs. other "ordinary clothing? Reminder - especially if you live in the east or midwest US, please take the Midwest Historic Costume Conference survey! You can keep up with us on Facebook or Tumblr at this time. Good luck with your new project! That's a great idea, and that kind of information that will be helpful for costumers too. It's a kind of book I've been missing. IIRC, Garsault mentions eyelets in the side waist used to tie a skirt in place. The eylets in the MFA stays sit right where the separate train meets the boned bodice in princess Sophia Magdalena's 1766 wedding gown, so perhaps they would've been used to attach a train (I have a booklet about the gown but it doesn't say how the train is attached.) On the other hand, it would be unusual to have a train, and then a separate bodice over a pair of stays. So a robe that extends to form a train may be more likely; a long garment that needs to have the skirt very firmly attached at the front waist (not just pinned). 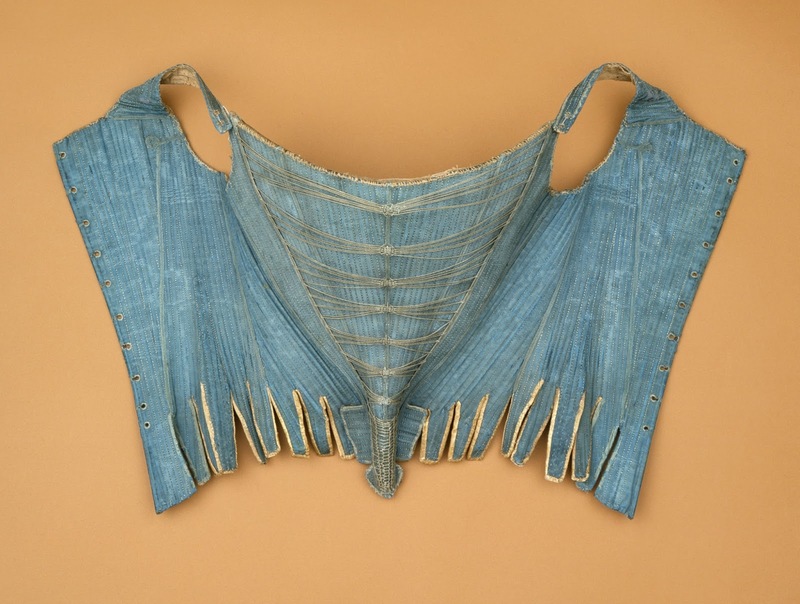 Perhaps the thread eyes at the center front might have helped hold the stomacher in place. The stays with a 1779 family provenance - I'm surprised that they did stays with a silk-covered (or other decorative) front that late; I associate it with early loose sacks, and similar undress garments that left the front of the stays showing. Thank you! I hope it is useful; so far it's been extremely helpful to me, anyway. It's possible that the strapless stays were worn for "everyday" by middle-class women, but I'm wondering if they might have been worn regularly by even wealthy women before straps became ubiquitous again with the more rounded late '70s figure. I hope I wasn't unclear, though! The 1779 stays are a very plain pair I linked to within the sentence, not the gorgeous blue ones.